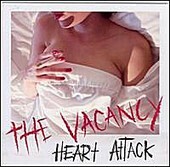 Pittsburgh, PA trio The Vacancy put their punk rock wares to the test on Heart Attack, the outfit's debut 11-track release. And while the band dabbles in both sunny So Cal punk a la Everclear and Alkaline Trio and dirtier East Coast sounds reminiscent of Hot Water Music, there's touches of Kurt Cobain creeping in and out of songs like "Majorettes" and "Blue Eyes" both vocally and musically. Effortlessly combining grunge rock and punk on tracks like the contagious "Get Up! Get Out!" with the panache of Local H meeting Brand New, The Vacancy manages to exhibit the depth-laden songwriting of bands like Everclear and The Cars without bastardizing the aforementioned outfit's sounds. Being an emo band that rocks more than whines may sound like impossible, but The Vacancy pulls it off convincingly here.